In recent years the life and work of Raoul Dufy has been the subject of increasing reassessment. In 2003, coinciding with the 50th anniversary of Dufy’s death, several major exhibitions were devoted to him while that same year the Museo Thyssen-Bornemisza placed four works by this French artist from the Carmen Thyssen-Bornemisza Collection on display in its galleries. The artist’s presence in Spain, however, remains limited. 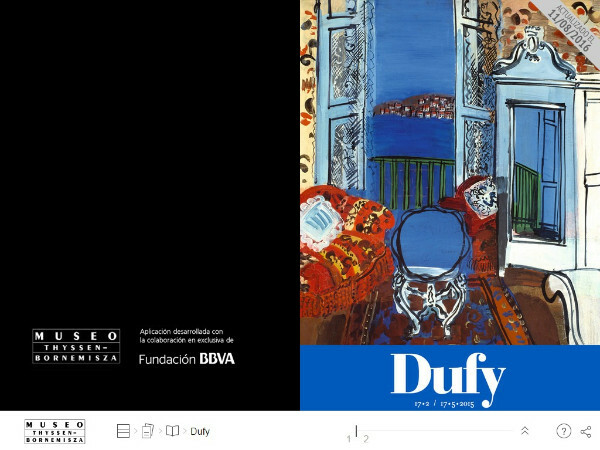 In 2015 and with the collaboration of the Comunidad de Madrid, the Museum offers a reassessment of his work that focuses not only on Dufy’s more hedonistic side as the painter of the pleasures of modern life, but also and primarily on his more introspective, reflexive and personal facet. In order to single out this aspect Juan Ángel López-Manzanares, the exhibition’s curator and a curator at the Museo Thyssen, analyses relatively unexplored issues within Dufy’s output such as the increasing distance of the viewpoints in his compositions, his synthesis of the everyday and the pastoral, the emotional reserve of his landscapes and the importance, particularly in his late works, of depictions of his domestic realm. In addition and for the first time, the exhibition includes the preparatory drawings that Dufy executed for Apollinaire’s Bestiary, alongside a number of prints.